Every two or three weeks it’s the same ritual. I go to the market to buy some feta: arrive at the deli, take my number and wait. No, that’s it. Thank you. I will probably start making some salad, usually a Greek salad with some feta on top or for a change I will use it with orzo pasta and shrimp or in a savory tart with some herbs and vegetables. But, as much as I love feta cheese and as much as my inspiration goes I just get bored sometimes with this same plain feta taste that I get again and again. Whether I use it to compliment a salad or a savory dish, it always leaves this same salty, goat cheese taste in my mouth. By the time I finish my pound of feta, part of it would go bad spending most of its time lonely in the fridge. A few weeks later, it’s back again. Go back. Think. Salad? Quiche? Salad? Fridge? Bad! Then one day it happened. The magic of the Internet and hours spent browsing other people food blogs have finally paid off. I have found the solution. Or the solution has found me? Anyway, we have found each other at Haalo’s blog. If you don’t know Haalo yet, which I doubt, then you should take a glimpse at her original recipes and mouthwatering pictures. 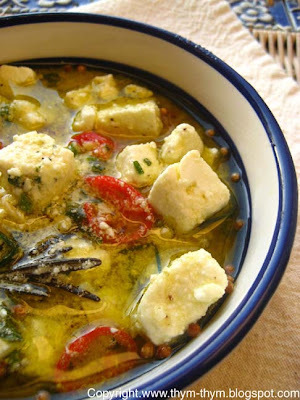 In her post she marinated the feta cheese with a variety of herbs and some “good olive oil” and then store it in the fridge for days to let the flavor develop. I basically did the same except for the use of some herbs and some lemon zest in mine. I used Bulgarian feta cheese but you can use whatever feta cheese you like. If you like the taste of goat cheese then you won’t be disappointed with Bulgarian feta. My only advice, and it is my personal experience, is to avoid cow’s milk feta cheese because the best feta is the one made with sheep or goat milk. The recipe doesn’t have the exact amount of herbs because, again it is everyone taste whether you like to add some herbs more than others. Feel free to experiment with this versatile marinade and to use it in salads or just as a dip with a slice of your favorite bread. I know my next trip to the deli will be more exciting this time because I know exactly what I am going to do with my flavorful feta. Pat the pound of feta dry on a paper towel. Carefully dice it in small cubes and place it in a bowl with the chili, the coriander seeds and the lemon zests. 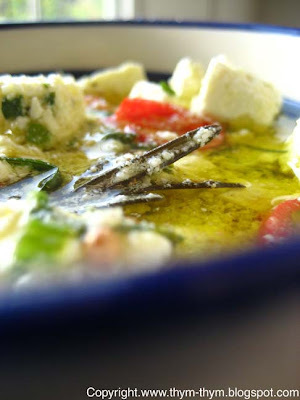 Chop the herbs and the garlic and add them to the bowl of feta. Toss gently with your fingers to avoid crumbling the cheese. Season with freshly ground pepper and toss again. Put it in a jar and add the olive oil until it all covers the feta. Seal and refrigerate. 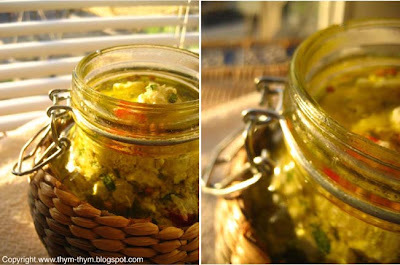 Prior to use it, put the jar of feta at room temperature until the olive oil is liquid again. Avant toute chose, Faites secher votre feta delicatement avec du papier et la couper en petits des. Mettre la feta dans un bol avec le piment rouge, les graines de coriander et le zest de citron. Hacher les herbes et l’ail finement et les ajouter au bol de feta. Melanger delicatement en utilisant vos doigts. Assaisoner avec le poivre et melanger encore. Mettre dans un bocale a fermeture hermetique et recouvrir completement d’huile d’olive. Mettre au frais pendant des jours avant de le consomer. Avant de le deguster, Sortir votre bocal de feta et laisser-le a temperature ambiante jusqu’a ce que l’huile d’olive redevienne liquide. Wow - this sounds fantastic. I can just taste it now - looks like I'll be stopping at the deli counter! Funny how we get stuck on one ingredient and then can use it all before it's gone bad. Beautiful photos. I'm a sucker for feta too and I've somehow never managed to get around to marinating it. Rose, that looks wonderful. I would like to try that. It would be sooo much better than the store-bought marinated ones. Great idea! I'm a feta fan too, but I usually buy it with the herbs already in it. It would be nice to make my own! Thank you! I've always enjoyed marinated feta, just never tried to make it. You have inspired me to try it. Love the addition of the lemon zest! comme cela doit etre bon ! - Thanks Beborah.Try it,You will love it. - And believe me Tanna, this is not the only ingredient I get stuck with. - You are so nice Lis Thank you very much. - Well, try marinating feta, Lucy and you wil never wanna eat it plain again. - Nora, not only this is better than the store bought one but you can also play with the marinade as much as your imagination goes. - Thanks Anali. This is so easy and so quick to make too. - Thank you very much Elle. I am happy to hear that my feta inspired you to start making your own marinade. - Je te le confirme Lili, c'est delicieux et tellement frais. Ideal pour un dejeuner leger sous le soleil de Paris. Rose, food bloggers are the most reliable source for recipes in my opinion. They'll give you great recipes, photos (so you know what your dish is supposed to look like) and their opinion, whether the food is good or not. Haalo is one of my favorite foodies and her recipes haven't disappointed me so far. I used to eat peta cheese in Korea. I want to buy and eat the cheese on my way home today. I want to add your blog into my 'Great Cooking Blogs' link. - Thank you very much Patricia. The lemon zest sure does give a fresh touch to the marinade. Not only Haalo recipe's are always a succes in my kitchen but she is also a very sweet person. - I am glad you like the feta recipe Catalyst. Try it and let me know how it goes. I am very touched that you want to add me to your blog list. Thanks. I put your blog on my link list. - I can't wait to see how it went for you Catalyst.Have a great day. - Thank you Kelly-jane. The glass holder is my favorite, a gift from my mother.